The Starry Messenger is a dramatic fun filled adaptation of Galileo's short treatise Siderius Nuncius. Galileo (dressed in 17th century costume) arrives at your organization to present a public lecture on his most recent discoveries made using his newly devised spyglass. As he describes those discoveries, Galileo's new method of observation and measurement of nature become apparent. Throughout the presentation your esteemed scientists are actively involved in experiments and demonstrations. The Starry Messenger is a dramatic adaptation of Galileo’s short treatise Siderius Nuncius. Mike Francis remains in character as he presents a public lecture (50 Minutes) on Galileo’s most recent discoveries that he made while using his telescope. The audience learns that Galileo turned his telescope to the heavens to discover mountains and craters on the moon, the four moons of Jupiter and countless stars never seen before. Using only basic mathematics, no calculus, no algebra, Galileo discovered numerous laws of nature. Throughout the presentation audience members are actively involved in demonstrations. Galileo then opens the floor to questions about his life, times and experiments. 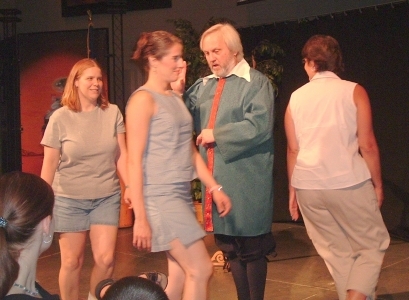 Mike Francis portrays Galileo and the Stargazer's Apprentice using over thirty years of professional acting experience on stage, film and television. A Physical Science and Physics teacher and formerly a lecturer for ten years at the Charles Hayden Planetarium at Boston's Museum of Science, Mr. Francis combines the science of astronomy with the dramatic skills of an actor. No special technical needs for audiences below 300. For larger audiences, a wireless lavaliere microphone and sound system are recommended. Hal Holbrook's "Mark Twain", James Whitmore's "Give em Hell Harry", Jim Cooke's " Calvin Coolidge, More than two words"